I’m Amanda and the handsome man with me is my husband Ben. Back in 2006 we got hitched. I moved from Minnesota to Montana where we lived in a 1960’s rancher Ben bought a few years earlier. For five and a half years, we worked our butts off fixing and updating our first home. In April 2012, we closed on our new home and started the process all over again. What can we say, we can’t resist a good project. Either that or we’re gluttons for punishment. Perhaps a little of both. Ben is immensely talented and has completed the majority the work on our homes with his own two hands and a few tools to help. I’m constantly surprised and impressed by his skills and work ethic. He’s always up to something. The man can.not.sit.still. I get the fun (and easy) part of designing everything from wall trim, tile layouts, even furniture! Don’t let that fool you, I like to get my hands dirty, too. I am a full-time stay-at-home-mom of two boys. They’re adorable (though I’m biased), energetic, fun, crazy, keeping us laughing and on our toes. I love to decorate, craft, sew, organize, and update our house to make it feel like home; our home. Of course I couldn’t limit decorating our home, so I make custom art prints, cut outs, and pillows to jazz up your home. Visit our Etsy shop to get your own. We’re certainly not perfect, but we love learning along this DIY home improvement journey. Sharing our trials, failures, success, and lessons learned on this blog is a fun and rewarding hobby. If we can provide answers or inspiration for others, I consider that a success. This online community of readers has turned into something more. A friendship; a conversation; a passion. None of this would be possible without you, lovely readers and friends. Thank you so much for taking some time from your day to stop by. You have an open invitation, so don’t hesitate to take a tour, ask questions, or just say hi! We love hearing from our you! If you have any questions or photos you would like to share, please send us an e-mail at ourhumbleabodeblog@gmail.com. You have some great ideas! Very creative! I especially enjoy the idea of the framed cork map to keep track of your travels. I’m really interested in graphic design but have little/no experience. Do you have any tips, websites, books that you would recommend? I’m glad you found our blog! Thanks for stopping by! I found your welded table project and am going to post it on http://www.curbly.com tomorrow (Monday 8/10). I hope that’s ok with you. I will link to your site you can be sure. I’m really wanting to learn how to weld so it caught my attention. That’s totally fine if you want to write a post about our table, as long as it has a link. Thanks so much for stopping by. Hi Amanda! I love your home and all the projects you’ve shared. I’m dying to know how you did your paneling(right term?) in your dining room. I’d love to do that in our small dining area. Thanks for sharing your family talent. It pays to have a husband that is so handy and talented. Thank you so much for your sweet comments! I’m working on a trim tutorial, so be on the lookout for it sometime this week! Do you plan to have a plate rack, too? It definitely is a nice perk for Ben to be so handy. We wouldn’t have as much done if we had to pay for the labor! Thank YOU so much for visiting! I’m so glad you are able to find inspiration from us! I’m still working on the room by room trim, but to answer your question, the beadboard is 4 foot by 8 foot panels, not the tongue and groove. Thank you so much for your kind comments! When we built our office bookshelves, we used MDF. We were able to use MDF because we broke the spacing up into thirds, so there wasn’t a long run. If you are planning on having your shelves wider than 2 feet, you should use plywood and add MDF to the faces to cover the ugly plywood edge. MDF wouldn’t be strong enough to make a larger span, as it would start to sag. Hope it helps! Most of our trim and such is made of MDF, and we have not had any issues with painting it. As long as the surface is clean and primed, you should be just fine. Good luck with your bookshelves-I’d love to see pictures when it’s done! I will definitely send you photos once it’s done. My kindergartner has asked us to tackle his room first! 🙂 Then we’ll work on the loft built-ins after. Thanks again and I really enjoy reading/browsing your blog. My day won’t be complete without checking your site and browsing through your inspiring DIY projects 🙂 More power!!! I have no idea how I found your site – just drifting through home-improvement/crafty blog-land 🙂 I studied Interior Design at the U of MN from 2001-2005. Were you there then? It’s such a small world! Thanks for stopping by! I was actually at Century Community College in 2004 and 2005 doing general classes. I took a semester of interior design classes in the spring of 2006… Are you from Minnesota? Am I just missing where I can RSS your blog? I love your blog! Thanks so much! I just the RSS option just for you! 🙂 Its on the right side just above the ‘Topics’ section. My husband and I own a early 1960s ranch and LOVE the trim work you have done in your house. We are thinking about doing the same thing throughout our house. We are both quite handy and have an extensive tool collection (the husband is the collector). Would you have any suggestions for our kitchen or should just skip it? The only place we could do trim in our kitchen would be 3 sections near our pantry (about 3 ft total) and our breakfast room, which is attached to the kitchen. We just redid our kitchen…took it down to the bones of the house…and installed an IKEA kitchen in a medium stain with Silestone counters. So, should we just forgo white trim in that room? Would pictures help? I can send pictures. I would love to see pictures. I lean toward yes with the trim becuase the breakfast nook is attached. Please do send pictures to ourhumbleabowed@gmail.com. Hi! I just fell upon your blog… perfect timing. I am just about to redo our home and you have some great ideas. I noticed you mentioned Montana… We are originally from Bigfork. GO GRIZ! I am offended at your accusation that I am creepy and/or stalkerish regarding John and Sherry’s baby center postings. I actually subscribe to the RSS feed, so I am notified when a posting goes up. If you go through their articles, you’ll see that I’ve only been the first to comment a few times, not EVERY time. I actually have people comment on my posts within minutes of posting and I am flattered. As for trying to be TOO much like Bower Power and Young House Love, that’s not intentional. It’s simply that I am a perfectionist by nature and these two blogs (among others) have raised the blogging bar, so to speak. I simply want to deliver great content and I know that I like the content of both of the aforementioned blogs. I leave comments on many blogs without links to my stuff, but I do like to leave links within my comments because essentially, it’s free advertising. With that said, any blog has the option to moderate or delete comments. If Katie or John and Sherry are annoyed with me (and other people) leaving comments with links, they have the option and the RIGHT to delete said comments or block that person from commenting completely. We live in America and have the freedom of speech, and I’m not harming anyone, so I’ll do it if I have something similar to add. If you don’t like this, you also have EVERY RIGHT to NOT read my blog. It seems that people are more willing and likely to leave mean, hateful and cruel comments through the Internet because they are nameless (using initials and fake e mail addresses) and faceless. It’s much easier to make a personal attack when you’ve never actually met the person (you may feel you ‘know them’ because you’ve read their content often). Finally, I don’t feel that my content is “sloppy seconds” to any blog. I write posts about things that I do and things that matter to me. 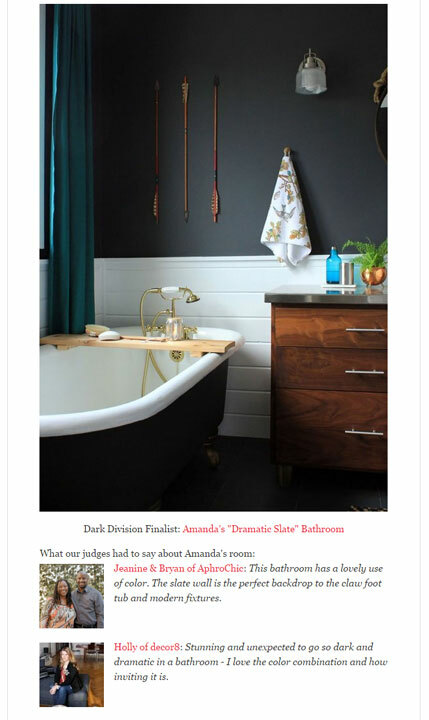 You could argue that ANY home improvement/decorating blog is sloppy seconds as there are SO MANY blogs out there. We both just happen to like and read some of the same ones. Ultimately, I do appreciate my readers (and I try to show appreciation by thanking people for their kind words and hosting giveaways-most of which are coming out of MY pocket), but I realize I cannot please everyone. If you do not enjoy reading my blog either because I’m a creepy stalker, copy cat, or I only dole out sloppy seconds, then please do not continue reading. However, if you have any suggestions for content, I would be happy to entertain the idea. I just stumbled upon your site from a post on Young House Love’s facebook. Can i just tell you how inspiring your site is to me and my husband? We just bought our first house last year and we’ve been slowly working on updating it. It’s not easy and requires lots of $$$ and time! The most inspiring thing is that our lovely little house is the same color as yours and all this time we’ve been looking to compare another similar ranch to see how white shutters would look! Your house is almost exaclty like ours and just seeing the before and afters is really MOTIVATING!!! Congrats on all that you’ve accomplished! keep it up! Thank you so much for your sweet comments! Really, I’m blushing right now. I’m glad we can provide some inspiration. Updating an old house is definitely a labor of love, but it’s so rewarding, too. I love looking at a finished project. We love our white shutters and window boxes. Though another option we considered was a slate grey. But the white is totally traditional and timeless, so we went that route. I would love to see pics of your house. If you need any help, don’t hesitate to ask! I have a question regarding your basement redo. Was it difficult to put in recessed lights in your basement? Our basement looks almost the same as your before….I just want to know if that project cost a lot of money ( just the ceiling and lights part). Umm, Ben installed the lights, so it’s not super difficult. He bought a set of 6 recessed can lights from Home Depot. They mount between the joists. If you or someone you know is good with electrical (which I’m definitely NOT), you should be able to do this. I believe we used the Halo brand, so you might want to see what you can find and ask the people at HD what would work best. Thanks sooo much Amanda!!! My father is excellent with electrical and construction work i just wanted to know exactly how much work i was asking him to do before i asked him to do it. I’m so excited now! I will definitely be looking into those HALO brand lights! You’re so welcome! I’m glad I could help! I would love to see pics, too, if you have a chance. i would love to share our before and after! i have a few! You can e mail me photos at ourhumbleabowed@gmail.com. I look forward to seeing them! Just wanted to leave a different opinion than “kc”: Thanks for posting your links on younghouselove, because that’s how I found you. I am currently doing 2 projets inspired by you (I will send pictures once they’re done) and I started my own little blog (but it’s in German and so far has only 3 entries). Thanks for a great blog and lot’s of inspiration! I’m glad you found us, proof my commenting does work 😉 I’m thrilled to hear that you’ve taken on projects inpsired by ours and I can’t wait to see the pics! As for always calling for a man to do the job, I most definitely do not think a female couldn’t do it just as well, if not better. When I say, get a man to help, I mean, I made Ben do it. More power to you that you’re handier than your husband! 🙂 I wish I could come close to Ben’s handy man skiils, but I can’t, so he has to install lights, build furniture and do the heavy lifting. I can’t wait to see what you’ve done! Did you know we’re also on Facebook? Please become a fan and share your ideas with our little community! Erin, I feel the same way! I’m due to have my first baby in spring time and I too would LOVE to be a SAHM! I’m up in Massachusetts and it’s not easy to live comfortably on one income over here….I also found this blog via YoungHouseLove. Both their website and Amanda’s are FILLED with WONDERFUL information and resources on how to update on a budget! and all the WONDERFUL decor ideas!! I love it and can’t get enough! I’m glad you found us and thanks so much for such sweet comments and encouragement!!! I totally understand that it’s difficult to live on one income. We can manage becuase Montana house prices are pretty affordable and Ben bought a fixer upper, so it was even more affordable. We also ltry to limit to things we need and things that fit our budget. I love being a SAHM, and I try to give DIY, budget-friendly decorating ideas that everyone can afford, including shopping at thrift stores and affordable box stores. I love so many things that I see in RH and PB catalogs, but I can’t afford ANY of it, so I make it instead. I wish you the best of luck to become a SAHM, it really is great. I’m glad you found the blog! That does sound ugly, but I’m glad you were able to make changes. Your paneling sounds lovely! I love white mouldings, as you can probably tell. Ours have held up well, too. If you get little scuffs on the white, Magic Erasers are wonderful. If you’d like to share your photos, I would love to see them. You can post yours on our Facebook page. Thanks for all of your sweet and encouraging comments, too! Thanks for all of your sweet comments! I’m thrilled that you’ve found so much inspiration. Please share e mails of any projects we’ve inspired you to do, or any that may inspire us or others 🙂 We’ll try to keep up the creativity and posts for you. Hi Amanda, I love your blog! Thanks for sharing your talents. I was looking for that post on the tree carving picture but couldn’t find it. I also looked at your etsy shop but didn’t see it. Are you still doing that type of artwork? Thanks so much for your kind words! Yep, it’s still avaliable. I just listed another in my Etsy shop if you’d like to purchase one, go here. Thank you for the DIY for the “cloud” lamp. I am a photo instructor and “redid” your finsihed shot (that you posted). I would like to send it to you (free of course). The shot now shows detail in the lamp and the room has been color corrected. Please let me know if you can use it. I would love to see it! Please send it to ourhumbleabowed@gmail.com. Thanks so much!! I love your blog! My friend and I just read the “kc” comment and can’t believe they posted that. I love all your re-do’s and content! Blue magic changed my thrifting life!! Thanks so much—I’m always on the hunt for brass now! Can’t wait to see your entryway when it’s done! Hi Amanda! Just found your blog via Design Mom. I love it and I love your house! I moved into a 1964 ranch last April and it’s been overwhelming. I was so glad to see that you’ve been working on your house for 4 years. I feel better about my progress. It does take a lot of time, doesn’t it?! I love the color of your livingroom walls (looks like it goes into the kitchen too?). I’ve been sampling every tan/beige/neutral color out there and haven’t hit on the right one. Would you mind sharing what you used? Thanks so much for your words of encouragement! It definitely takes a lot of time (along with money and planning). Our living room walls are Wicker Chair by Olympic. It’s a nice, medium-dark tan. We have a slightly lighter version in our kitchen, but I don’t recall the name right now, but I think Wicker Chair is a better neutral with depth. Hope it helps! I have done most of the work in the house my husband and I purchased just over 1 year ago. We are working on redesigning and fixing-up along with my husband ( I actually ripped up the carpeting in our living room and hallways and laid Pergo down by myself while my husband was away in Germany one weekend). So anyhow, the one room I have dared not touch (until now) is our bedroom. It is relatively small and SO awkward. I fell upon your blog through a Bing search and fell in love! You and your husband and your designs and ideas are so wonderful and perfect! Thank you very much! I have still yet to decide what to do with the darn room but will be searching more of your blog posts for inspiration and ideas. Thanks again! I absolutely love your home! It’s beautiful! Can you please tell me the paint colour in your living room? I love you blog, and love you dining room makeover! Very Beautiful! Hi Amanda. I was searching for a pier1 ornament candle holder because my daughter broke mine last night. We’ve been having fun changing out the ornament for each holiday and season. When it went down in action (actually, I should say exploded into 1,000,000 pieces on my wood floor) it had shamrocks hanging inside. Anyway, if you have any ideas as to how to lay my hands on a replacement, I would be so grateful. It was a gift this past season from a really good friend and we really had been enjoying it. Thanks so much! That’s too bad! Do you have any photos of it before it broke? If so, send it to us on our Facebook page ( https://www.facebook.com/pages/Our-Humble-ABowed/120919047970619?ref=ts ) and we’ll see what we can do. So sorry! I am really impressed about your design and style. Looking for some ideas for our new home and I’ve already found a lot. Amazing that you do all the stuff mostly by yourselves. I am looking forward for your new ideas. Funny: we have something in common – our son (10 month) is called Vincent, too. Thats also why I bookmarked the ABC-Picture. Thank you so much for your kind compliments! That is funny that your son’s name is Vincent, it’s not especially popular. Love the ABC name print from Made by Girl, glad you do too! Hey there! I went ahead and (finally) built out a blogroll on my blog, http://www.DesignBuildLove.co, and added your blog to it! Just thought I would let you know because I LOVE your blog so much! 🙂 Thanks for the inspiration! May I ask where you got the 2 little statues in your office? It looks like one is the empire state building. I think I may have seen something like these at Home Goods a while back?? Not sure, but I am now searching for them. Any help is appreciated! Hi Carol! You definitely may ask! I picked up the wire buildings (the Empire State and Chrysler buildings) at Target last year, but I have seen similar items at TJ Maxx and Ross. I would keep searching Home Goods and other discount stores to see if you can find them. I haven’t seen them at Target recently, sorry I couldn’t help more! Just wanted to say how much I enjoy your blog. I love your style and a lot of your ideas inspire me as well. Your blog is one of my favorites, and I read a lot of design blogs! Thank you so much Britny, I’m blushing from your sweet comments. 🙂 So glad you’re finding inspiration and enjoying what we’re sharing. I know I’m late to this blog post but I’ve just began following you. I’m taking my hat off to you for pursuing what you found yourself to be good at. I too taught myself Photoshop and began making all things involving paper. I wish I had the guts to give it a go full-time. My husband and I are newlyweds and are looking to purchase our first house and we are looking for a 60’s ranch in the Ann Arbor, Michigan area to fix up just like you and your hubs. Once again, I want to say “Good for you” that you found your niche and are pursuing what makes you happy and what works for your family. Aww, Ayisha, you’re making me blush! That’s awesome that you’ve taught yourself Photoshop, too. If you want to give it a shot, you could set up an Etsy shop (if you haven’t already) and start out part time. Just to see how it goes. Good luck on finding a little rancher. Fixing ours up has been a fun road. So glad you’re liking our blog. kc sounds like a turd. I think your house is really pretty. You all have clearly put tons of work into it. Go you. Love the DIY built ins. Thank you, different KC. 🙂 We love the built ins, too. I am so happy to hear that you’ve been inspired by our home! That is one of the best compliments. 🙂 Yep, the Ikea table is a great height for our bedroom and the basement sectional. I actually want to buy two more of these for our bedroom. I’d love to paint them a fun color, too. Our main living level is about 1250 square feet, so our total square footage is just under 2500. Our walls are smooth, so we just install the MDF right over the wall and paint everything. If your walls have texture, you could install a thin sheet of something behind just to cover it. Hope that helps! Hi. I am from Mexico living in the Caribean Cost, very diferent Climate but looking for pictures of apple trees find your website, and I really like the yong trees you have in your Garden, and I can see you have a Very beautiful house and just loved the trees with fruts. Tienes una hermosa Casa !! Hi! Thanks for your terrific blog and inspirational work! I’m closing on my first house this week and would love to know how you did the trim work on your walls. Did you create your own wainscoting panels or create the effect with trim pieces? I’m leaning toward the latter and hope your have some tips! Anyway, just wanted to say “hi” and thanks for the great blog! Wow! What is wrong with that KC person? And apparently it takes a creepy stalker to know a creepy stalker, because apparently KC keeps track of the “first comments” from YHL. I think you have a great blog and I am glad I found it through YHL. I’m an art teacher and if I worked in the home like you I would love to do some more projects like this. Real artists are usually not in competition with each other (as KC implies), but are inspired by each other. Plus I like you because I gather you are from MN and so am I. 🙂 Keep the posts coming! Another YHL blow in : ) Jsut wanted to say, I’m new to the blog and am blown away! We’re at the very start of planning our won renovations/extension so I’m sure I’ll be here plenty for inspiration : ) Also, a little tip, if you are looking for graphic design tutorials lynda.com and http://methodandcraft.com/ are excellent! Helllllloo Amanda! I just found your blog over at YHL! I’m gonna go snoop around but I’m digging your blog! So glad I found your blog. You guys look like you are doing awesome things to your house! I’m jealous of your kitchen. Also love hearing about Minnesotans moving west. I’m from MN but now married and living in Idaho! Do love the west, but miss Minnesota summers! Hey Kristin! I’m so glad you found our blog too. 🙂 Thank you so much for your kind words. You’re not too far from us then. I don’t miss the Minnesota humidity, but I do miss the water. Montana is so dry, especially compared to the land of 10,000 lakes. I tried to vote for you but cant find where to vote! I just found your blog…from someone else…sorry don’t really know how I ended up here. anyway I am so happy I did! I love what you and your hubby have done! I have to tell you I am so jealous that you husband is beyond handy. When I met mine I had to teach him how to use a drill…his own drill!! And it pretty much ended there, my parents remodeled and old farm house before i was born and i grew up knowing how to handle myself in the field of maintenance. But my poor husband is a plumbers son and cant even stop a running toilet. But he can cook like there is no tomorrow. Thank you for your great blog/site I have soooo enjoyed it. really and truly what you have done is amazingly beautiful!!! Thanks so much for your kind words! I had a chuckle that you had to teach your hubby how to use his OWN drill. Haha. That’s nice that he’s a great cook. 🙂 We can’t be good at everything, can we? 😉 So glad you’re enjoying reading along with our adventures in home improvement. What a great blog ! I live in Billings and are anxious to see more in your blog! My hubby and I do the same as you “do it yourself ers” We are just thinking of starting our 3rd house redo! I’ll be checking in for ideas! Great job! Also, I’m loving the new banner and background! I’m so excited to have found your blog! There aren’t a whole heck of a lot of Montana bloggers so I’m always thankful to find another one (being a transplanted Montanan myself)! What a beautiful family you have! Aww, thanks! I think I’ve encountered two other Montana bloggers, so it’s definitely exciting! I just found your blog last night via Pinterest, and I am so happy that I did! I can’t wait to scope out some more of your fabulous projects later! Last month I purchased 3 of your prints. I just want to tell you that I absolutely love them. I kept 2 and had one made for my son and his wife for Valentines Day. They too (well My daughter-in-law) love their print. Thanks for the great sale that allowed me to get all three prints. Love your blog, you are very creative. Amanda, I just wanted to say thank you again for sharing your blog again. It is truly a pleasure seeing you transform your new house. I know we’re a little late to the party here, but we’re new to your blog and found you via your comments on YHL, so I just wanted to second all of the encouraging comments and thank you for continuing the blog, even in the face of mean-spirited and cowardly comments! We haven’t run into any of those on our blog yet, but way to keep it classy and not stoop. When that day comes (as I’m sure it will), we’ll be looking to your example of how to handle it with grace and determination. I’m so glad to have found your blog. I have a great app to share with you. I’ve been an (award winning) color consultant for many years, and have 2 best selling books on color. This year I released an app called Color911 for instant help with color. You can create your own palette, take photos of anything and pull the colors from the image to fnd your color inspiration or use any of the 60+ color themes within the app. For anyone who loves color it is a priceless tool, and lots of fun to use. I hope you check it out: Color911.com. Enjoy!